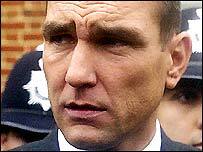 Footballer turned actor Vinnie Jones has been sentenced to community service and ordered to pay £1,100 for "air rage" offences. The 38-year-old former Wimbledon midfielder became angry when fellow passenger Stephen Driscoll told him he was being "annoying", sparking a tirade of "frightening" threats from the soccer player turned film actor. Jones, 38, who starred as a gangster's hard man in the movie Lock, Stock and Two Smoking Barrels, slapped Mr Driscoll 10 times and repeatedly asked whether people on the aircraft knew who he was, Uxbridge Magistrates' Court heard. He was given 80 hours community service after admitting assault and using threatening words or behaviour towards members of an air crew. Jones, from Wiggington, Tring, Hertfordshire, was travelling in the first-class cabin of a Virgin Atlantic plane from Heathrow to Tokyo in Japan on 31 May this year when the incident took place. After the hearing a statement was read outside the court on Jones' behalf in which he said he "regretted the incident deeply". He also said he would carry out the community punishment "with grace". Ms Gillian Travers, prosecuting, said Jones had been sat drinking with fellow passengers when he became "boorish" and one woman decided to leave the group. When Jones approached her another passenger suggested he sit down. The court heard he lost his temper and hit the other passenger with an open hand, one witness statement said he hit him around 10 times. Jones' defence said no injuries or bruising were sustained. When air crew tried to intervene Jones said: "I can get you murdered. I can get the whole crew murdered for £3,000", having already shouted at one of them "Go and do what you are paid to do and make the coffee." Several members of the crew felt intimidated by what had happened on the aircraft, the court heard. Mr Henry Milner, for Jones, said he had offered to compensate passengers who moved to economy class from upper class because of his behaviour and had apologised to cabin crew. Jones captained Wales and also played for Chelsea and Leeds and was player-coach at Queens Park Rangers before turning to acting. As well as community service, Jones was also fined £500 and ordered to pay £300 costs and £300 compensation to the passenger he assaulted. Prosecution lawyers withdrew a charge of being drunk on board an aircraft. "Throughout his career, Jones has had a reputation as a hard man"